I have just watched the third episode of CNN’s Original Series about the Sixties. This affected me so much that I feel that I must include the episode here today, and urge all to read and distribute it to friends. 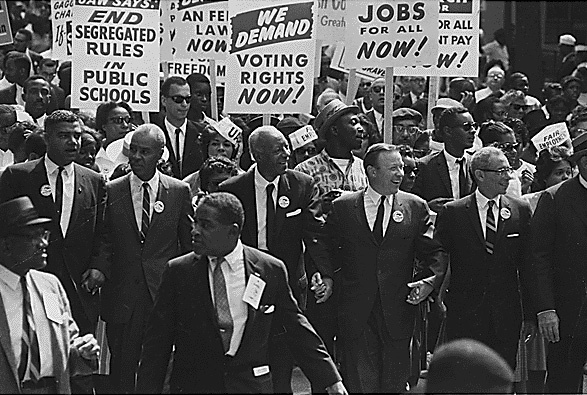 It is 50 years since the Civil rights Movement began to grow tall. But, 50 years later, despite Federal Laws, states are still denying voting rights to American Citizens and are even using underhand means to keep the minorities ‘in their place’. This is unacceptable. After watching the video, it is beyond shockingly sad to see after this struggle, that for some, racism never disappeared, it was always just waiting below the surface to explode again. For some in the South, it was always there even after the Civil Rights Act became the law. The electing of Barack Obama in 2008, brought the haters back into play. At first tentatively, then after much public disrespect from a few leading RW politician, it bloomed into an ugly full blown, no holds barred race fest. It goes by many names, from socialist, Marxist, to “secret” Muslim for the President, to lazy, violent, and “Welfare Queens” back to the Reagan era, for any person of colour. The fact that they are born and bred Americans is secondary, so is the indisputable fact that there are more white people on welfare than black people, but this is not about welfare, it’s about discriminating against a group of people who might and will vote predominately for a Democrat, and it is therefore against your Constitution even though the Right leaning SC were dishonest enough to claim otherwise. Racism is alive and shamefully well from the highest court in the land down to RW led local government throughout the land. It’s time to take a stand to vote out the haters, starting this November. They are few, you are many. Thanks for posting the video, ppo, it was defininately worth watching to remind us all of that long road to freedom and equality however much the RW try their best to reverse it. Btw, I’m glad that I watched it when I did because the video now has a message that it was removed by the user. Mind boggling as to why. PPO, the sixties were both wonderful and terrible for me. America grew and changed during that time. In 1968 when MLK was killed there were riots in Washington DC and I was there with the Sixth Armored Cavalry to disperse rioters. Ppo, I am experiencing computer problems. Will write on this subject when trouble is fixed. This is a wonderful series presented by CNN that captures some of the important issues that were addressed in the 60’s, issues that still persist today although not quite as overt. Thank you for posting this PPO, I’m sure many will enjoy viewing the video. Many of us that have reached my age not only know most of the story, but were involved in many of the incidents detailed here. Those were gut wrenching, exhilarating days that helped to change a nation it was a giant leap forward for many. Those that did not approve are today trying to roll back the accomplishments and their efforts some of them appear to be successful. We as a nation need to see presentations like this one and others more often, they help the citizens of this country to realize that government is not always correct, and for that matter in events like this one are often on the wrong side of justice. Thanks again for posting this, I hope everyone will take the time to view it. for those who haven’t the time to view the whole program, the Voter Registration section begins at 58:05 approx.